For those of you who follow this blog, you know that in recent months we have re-positioned our startup and that we no more designing a personal task planner but instead, a creativity space to team up with others and do what is important today. We are currently experimenting to find a viable solution to enable asynchronous communication between teammates who share a to-do list. It is not a simple challenge. We still have many months of work in front of us before being ready to market a version 1 of this service. Lately, we worked hard to find the name of this new service. The importance of choosing the right name for software as a service (SaaS) is not to be taken lightly. Not only the name of your service is an important part of its “business card” on the web and in the apps store, but the name will enable customers to remember your product. This is about making your name talk-able. An easy name will make it easier for current users to refer your name to others. It is very well known that advertising is not a trustworthy marketing tactic as much as word-of-mouth. The name is probably the first thing prospective customers will find out about your application. It is a good way to differentiate yourself from your competition. We chose the name To-Do Studio. Not only it is talk-able and the domain name to-do.studio was available, but it clearly explains what differentiates our application of the hundred Todo apps that already exist on the market. First, it was important to have the word “Studio” because our service provide a creativity space to team up with others (aka a studio). Second, we choose the word “To-Do” to fully explain that the collaboration is done through to-do lists. We did not feel the need to change the logo because it still communicates the right message. On the other hand, to focus on a single name, in due course, we will also rename our company with the same To-Do Studio name. Categories: Lean Startup | Tags: Naming | Permalink. The biggest risks founders face when starting something new is to keep working on the wrong idea and burnout. We are now convinced that the market does not need another daily planner to manage to-do lists. This learning was a long and winding process. Success often comes down to a very small moment when a decision is made that has a significant impact. About a year ago, we decided to improve our daily planner by adding the ability to team up with others. At the time, this decision to share to-do lists with your close ones seemed like a secondary feature. Lately we have finally realized that it should become the main feature of our service. We experienced the “Aha!” moment of sudden realization, inspiration, insight, recognition, and comprehension… that we are working on the wrong idea. This awareness explains why the DayTickler product is still not available. We did not want to invest anymore in a product that is never going to be viable. 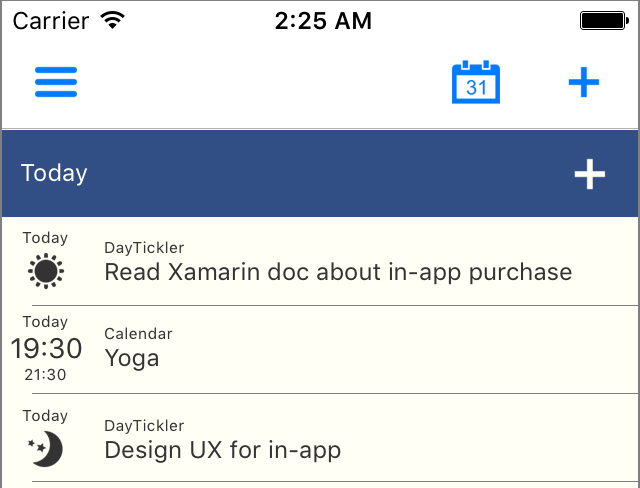 The main service of DayTickler is not anymore, a daily planner but instead, a creativity space to team up and do what is important today. We are back to the drawing board.